The PC showed up strong at CES 2019. The PC’s been enjoying a resurgence over the last few years, and judging by what we witnessed at CES, the pedal will remain planted firmly to the metal in 2019. AMD, Intel, and Nvidia all hosted blockbuster keynotes brimming with big announcements. Monitors evolved beyond being simple 27-inch rectangles. Gaming laptops embraced innovation in wildly different ways. And there’s a lot of gear coming that’s just plain badass. These are the big CES hardware reveals and trends that PC enthusiasts need to know about. Buckle up, and be sure to hit those links if you want deeper details about any of these topics. 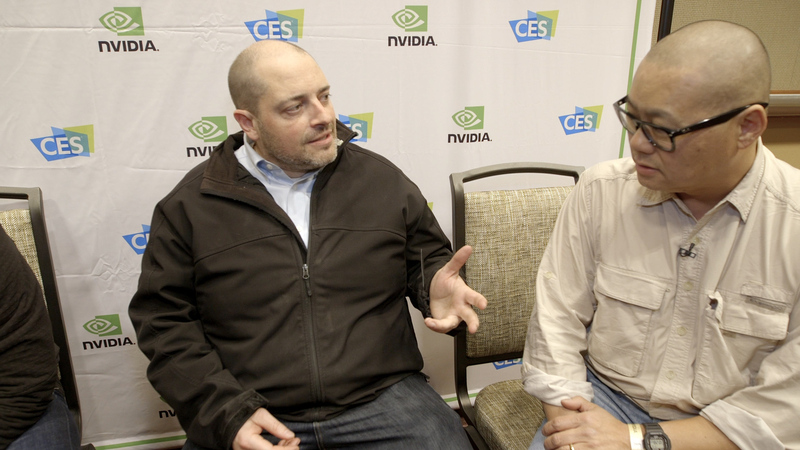 Nvidia kicked CES off with a bang in its Sunday night keynote. 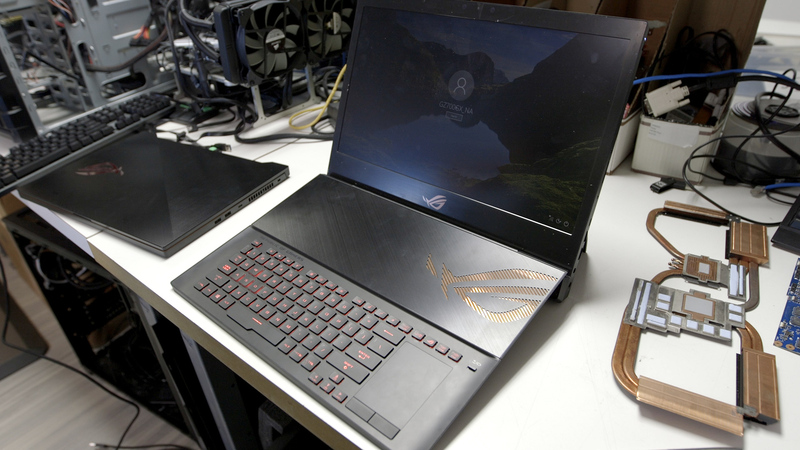 Unsurprisingly, the company continued its real-time ray tracing push, bringing the technology to the masses by announcing mobile RTX GPUs that appeared in almost every new gaming laptop at the show. Nvidia also pushed its cutting-edge tech towards the mainstream with the $350 GeForce RTX 2060, a powerful graphics card that excels at both 1440p and 1080p gaming and comes packed with the dedicated RT and tensor core hardware needed for real-time ray tracing and AI-enhanced Deep Learning Super Sampling. 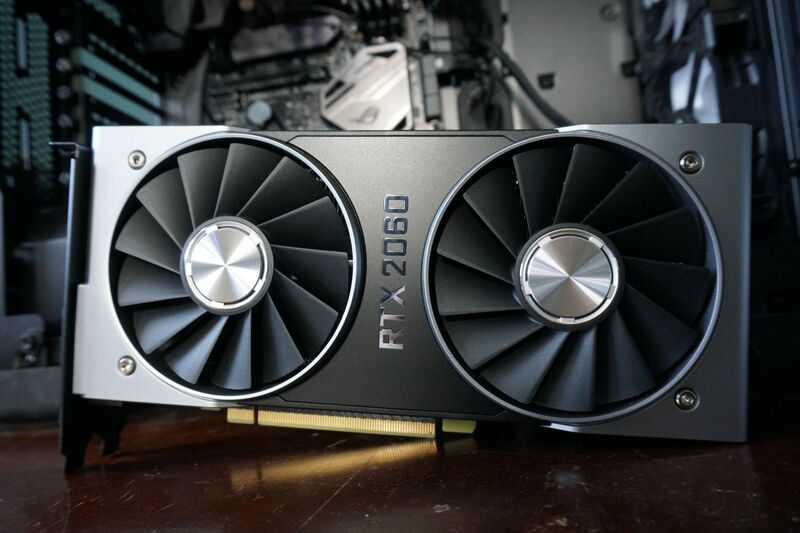 The RTX 2060 isn’t hitting the streets until January 15, but it’s already hit our test bench and we absolutely love it even though it costs $90 more than its predecessor. Nvidia’s GeForce graphics cards will receive a driver update this month that allows them to tap into the variable refresh rate capabilities of VESA Adaptive Sync monitors—a.k.a. AMD FreeSync. Until now, GeForce GPUs only worked with Nvidia’s rival G-Sync monitors, which require special hardware and thus cost much more money. But that hardware and Nvidia’s oversight also gives G-Sync monitors a higher level of quality control; of the 400-plus FreeSync monitors Nvidia tested, only 12 met the requirements to earn a “G-Sync compatible” certification and have variable refresh rates automatically enabled by the new driver. On the plus side, you’ll be able to manually enable variable refresh rates on non-certified monitors via the Nvidia Control Panel. On the minus side, things can sometimes get ugly if you do, from unwanted blurring to full-on “blinking” effects. In December, Intel showed journalists its new 10nm “Sunny Cove” CPU architecture. 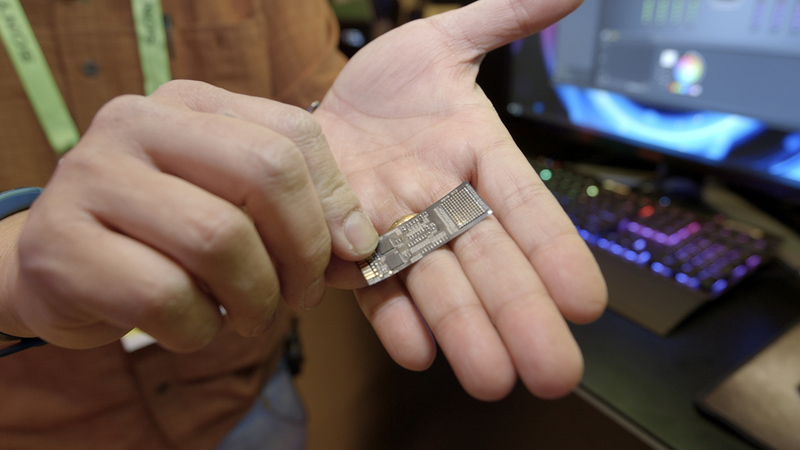 At CES, the company revealed the processors that will use it, formally unveiling Ice Lake chips that also integrate Thunderbolt 3 and next-gen Wi-Fi capabilities. Speeds, feeds, and other concrete product details weren’t disclosed yet, however, as the chips are scheduled for a holiday 2019 launch. 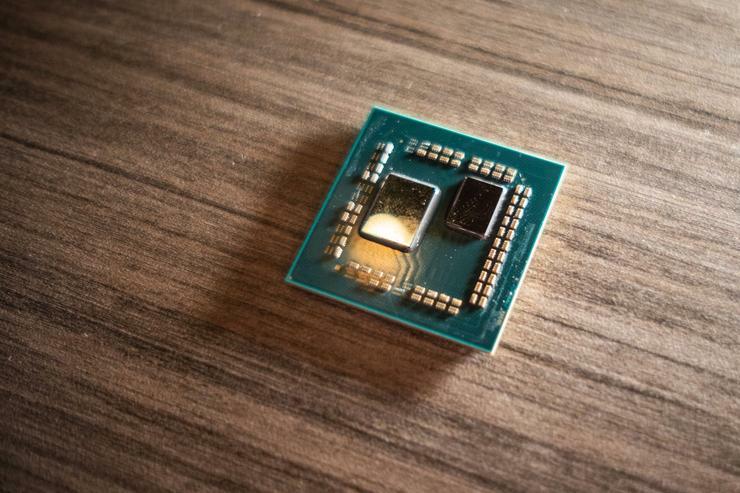 Intel also announced new processors for the current 9th-gen lineup to hold us over until then. Then things got funky. 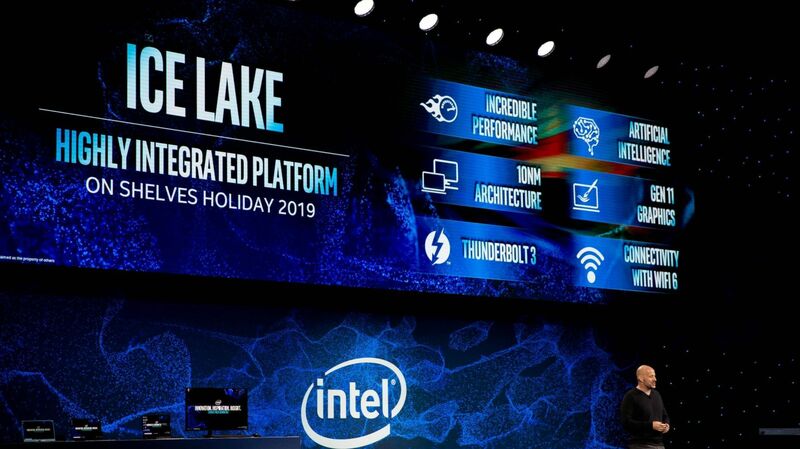 Intel’s “Lakefield” chips will stack four Atom CPUs atop an undisclosed Sunny Cove processor, using the “Foveros” stacking technology the company revealed during its December Architecture day. Stacking chips lets Intel squeeze out more performance without increasing the overall die space—a boon for thin-and-light laptops. Speaking of thin-and-light laptops, Intel also revealed Project Athena, an industry-wide push to make a new generation of longer-lasting and much more responsive notebooks, backed by computer makers like Acer, Asus, Dell, HP, Lenovo, Microsoft, Samsung, Sharp, and Google. Yes, Google—Chromebooks are part of the push. PCWorld sat down with Josh Newman, the general manager of mobile innovation segments for Intel, for an exclusive look at Project Athena’s guiding principles. Don’t miss it. AMD’s keynote might have been last, but it certainly wasn’t least, as the company announced the world’s first 7nm desktop CPUs and GPUs, giving it a technological edge over Nvidia and Intel—for now, at least. First up: Radeon VII, which uses a supercharged version of the Radeon Vega GPU built on 7nm. AMD equipped the GPU with a whopping 16GB of super-fast High Bandwidth Memory. The company says the Radeon VII will deliver a great 4K gaming experience and trade blows with Nvidia’s GeForce RTX 2080 in both performance and price. (Nvidia’s CEO already dissed the Radeon VII, calling it “underwhelming” and “lousy.”) We’ll be able to confirm that performance ourselves soon, as the Radeon VII will launch on February 7, at a cost of $699. Sadly, AMD didn’t provide any updates on its next-gen “Navi” architecture expected to release later this year. 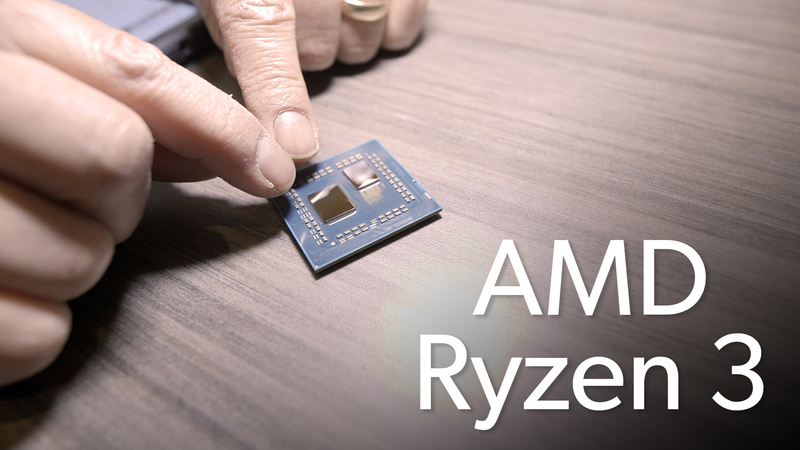 AMD also offered a preview of its 3rd-generation Ryzen CPUs, although details were light. CEO Lisa Su said it “will absolutely set the bar for performance and power efficiency,” and in a head-to-head live comparison against Intel’s flagship Core i9-9900K onstage, a similarly equipped 8-core, 16-thread 3rd-gen Ryzen chip scored 2,057 points in Cinebench, topping the 9900K’s 2,040 points—and with a significantly lower power draw. Impressive stuff. The new Ryzen CPUs will also be the first mainstream processors to support PCI-E 4.0. Look for the chips to launch sometime in the middle of the year. But maybe not with that 8-core chip as its standard bearer. In a candid, wide-ranging interview with a small roundtable of reporters after the keynote, Su strongly hinted that 3rd-gen Ryzen could hit 16 cores. Yes, please! Computer makers are already putting all of the new hardware from AMD, Intel, and Nvidia to good use, too. Sure, we saw the expected updates to tried-and-true laptops like the Dell XPS 13 and Lenovo’s ThinkPad X1. And they look great! But more interestingly, there were a ton of outright wild notebooks at CES 2019. The new HP Omen 15 offers a screaming-fast 240Hz display unheard of in laptops. The MSI GS75 Stealth manages to squeeze a top-end Core i7 and Nvidia’s RTX 2080 Max-Q into a notebook that’s just 4.9 pounds, while Gigabyte’s Aero 15 uses Microsoft-powered machine learning to compare your workload against its own database of applications, then optimize battery life accordingly. Clever. And then there’s the really weird stuff. The Asus ROG Mothership is basically a gaming-ready Surface Pro rival with a detachable keyboard and the most fearsome hardware possible. Acer’s Predator Triton 900 pairs its formidable firepower with a 17-inch, 4K display that swivels on its hinge so the screen faces outward. And the Alienware Area-51m completely revamps the Alienware aesthetic while simultaneously offering desktop-grade hardware and a laundry list of options and upgradable parts, complete with handy markers on the bottom panel that explain how to swap those parts out. 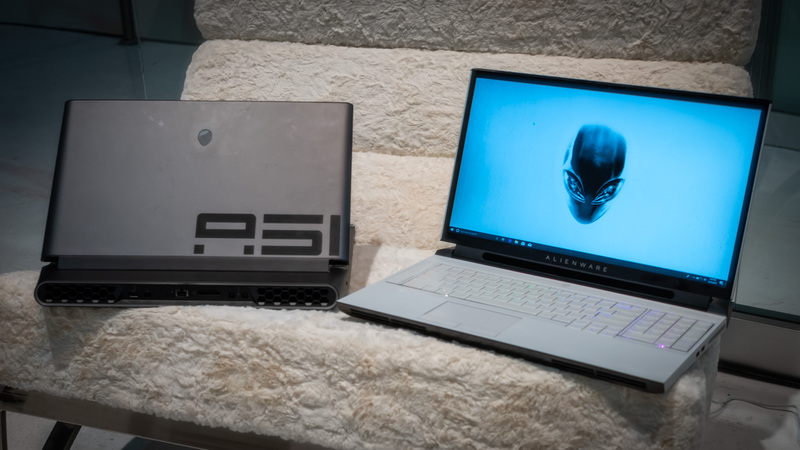 At CES 2019, laptop makers started truly thinking outside the box to make their products stand out from the crowd and cater to the surging crowd of PC gamers. I love it. 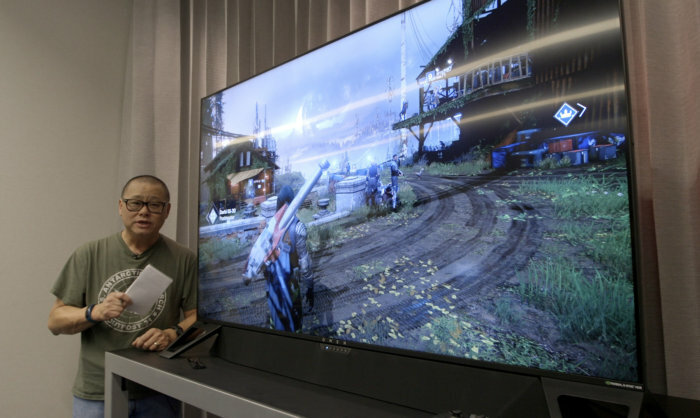 Nvidia embracing FreeSync alone is a momentous shift and a major milestone for PC gamers. But at CES 2019, all sorts of monitors stole the spotlight by bucking convention. The most notable display remains tied to Nvidia. The stunning HP Omen X Emperium will be the first Nvidia “Big Format Gaming Display” to hit the streets with a gargantuan 65-inch 4K HDR panel, an ultra-fast 144Hz refresh rate, and G-Sync. It also comes with Nvidia Shield functionality built in as well as a soundbar custom-tuned to avoid disrupting the display. And did I mention it’s 65 inches? Not to be outdone, Dell announced a 55-inch 4K Alienware monitor outfitted with a luscious OLED display for deep blacks and fantastic color reproduction. It’s fast, too, at 120Hz. And seemingly every major PC maker jumped onboard ultra-ultrawide or ultra-big monitors, from Asus to even Lenovo. (We really weren’t expecting Lenovo to announce ultrawide gaming displays!) Samsung showed off a new iteration of its ultra-ultrawide monitor that started the trend, in addition to one that can be pushed back to sit perfectly flat against the wall. Adios, boring glass rectangles. Hello, immersion. 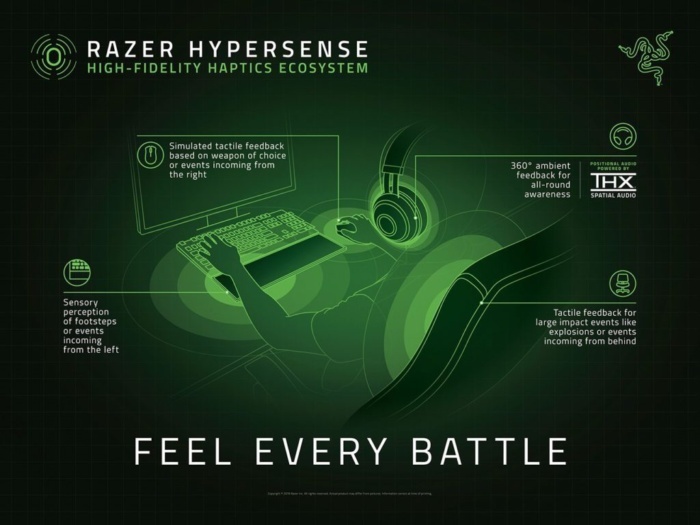 Razer wants to bring immersion to your peripherals too, using a technology sorely underutilized on PCs: haptic feedback. Razer HyperSense builds on the success of the company’s impressive Nari Ultimate headset by integrating rumble controls into all of your peripherals—from keyboard to mouse to chair to headset. In Razer’s example, your keyboard’s rest wrist could vibrate to simulate movement on your left, while your mouse could rumble to simulate right-side movement and the kickback of a gun. Your chair could physically let you know when something happens behind you, whereas your headset could provide full situational haptic feedback, as it already does with the Nari Ultimate. And HyperSense achieves it all by simply reading the low-frequency range of your audio, so game developers don’t need to work to support the technology. It’s an incredibly nifty idea that shows just how much more immersive PC gaming can be compared to consoles. But will it ever be more than just an idea? That’s the question. While game developers don’t need to implement HyperSense, hardware makers do, and it remains to be seen if Razer’s rivals will jump on the idea. At CES, Razer said the Subpac vest and Lofelt’s mouse and wrist rest prototypes support the technology. Fingers crossed we see more about HyperSense soon. Some other notable CES announcements: EVGA got into sound cards. SanDisk showed a portable SSD so fast, you can edit video on it. HTC revealed two new Vive VR headsets. This Targus USB-C dock drives up to four external monitors. And Corsair may have revolutionized RGB LEDs. This is all just the tip of the iceberg. Head over to PCWorld’s CES landing page to see all the laptops, desktops, and components that caught our eye at the show.